I’m so lazy sometimes when it comes to making desserts. 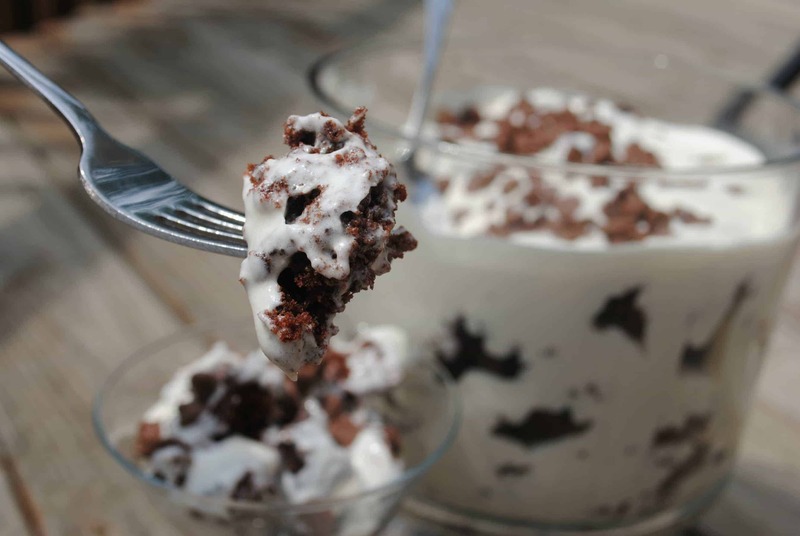 Trifles are such an awesome way to get a great tasting treat with much less work. 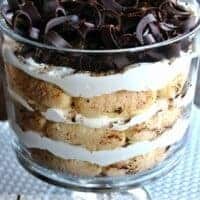 This tiramisu trifle came together in no time at all! You could layer this in a square baking dish if you don’t have a big bowl. I’ve done that before with trifles, still wonderful. And the curls on this? OMG the curls. Here is my secret to making beautiful chocolate curls. Well, it’s not really a secret, it is probably how most people make them. But if you have never made them before, here is MY tutorial. First, USE GOOD CHOCOLATE. Think about it, when you put one of those chocolate curls in your mouth, you want it to taste amazing! I like to use chocolate bars like Green & Black’s Chocolate. They melt beautifully and taste delicious. 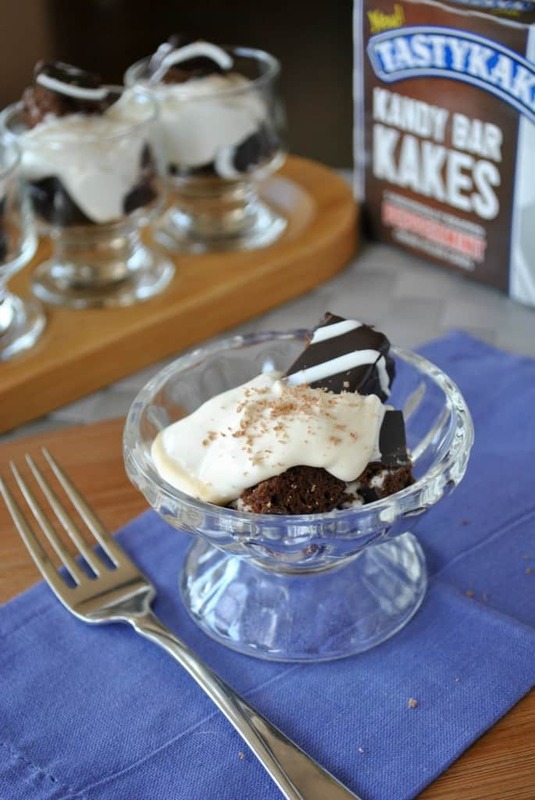 Two important points when making (and eating) chocolate curls! So, melt your chocolate bar (I used Green and Black’s 85% Dark Chocolate). I stuck mine in a glass microwave safe bowl for 30 seconds. Stir and heat another 30 seconds. Pour your melted chocolate onto a metal baking sheet (preferably one with no sides, it makes it easier to work with). I used a metal cookie sheet. Try to shape your melted chocolate into a large square, using a knife or spatula. You can decide how thin you want it. I wanted some thicker chocolate curls. If you go too thin your curls will break. Once you have your square of melted chocolate, stick your baking sheet in the refrigerator. I set the timer for 7 minutes, no more no less. It comes out perfect. The chocolate isn’t HARD, but it also isn’t runny. You may need to play with this time, depending on your refrigerator and the thickness of your chocolate square. If your chocolate gets too hard, put it back in your bowl, heat it, and start over! Now that you removed your chocolate from the fridge, take a metal spatula (I use a small Pampered Chef spatula…not those silicone kind). You can also use a brand new putty knife. Yep, that would work great too. Scrape your spatula along the end of your chocolate square slowly and the curls will form! Here is the first video I watched in how to do it properly from Heather of Sprinkle Bakes: VIDEO. You can see in that video she made small curls like the ones I have on top of the trifle. But if you take your spatula you can change the thickness of your curl and make “tubes.” So fun. AND, if you used good chocolate, SO delicious! 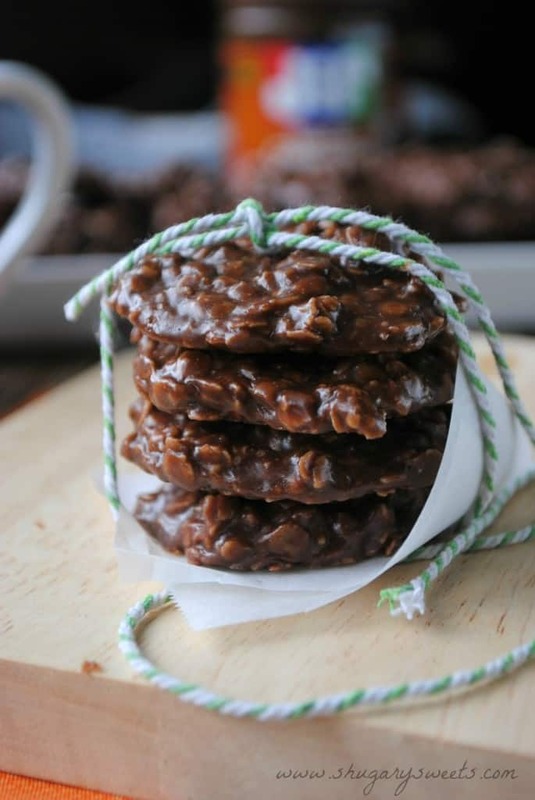 No Bake Cookies with Double Espresso: perfect for breakfast to get you going for the day! 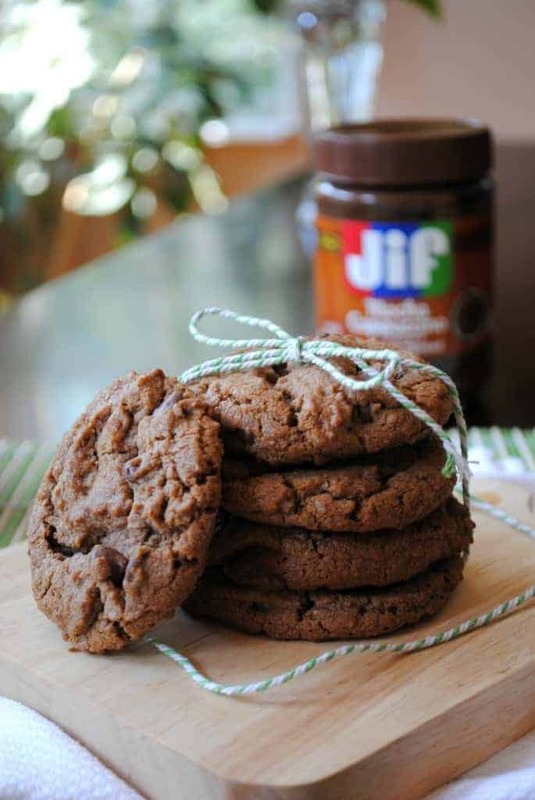 Chocolate Mocha and Nutella Cookies: Nutella and Jif cappuccino hazelnut spread combined with espresso powder make delicious cookies! 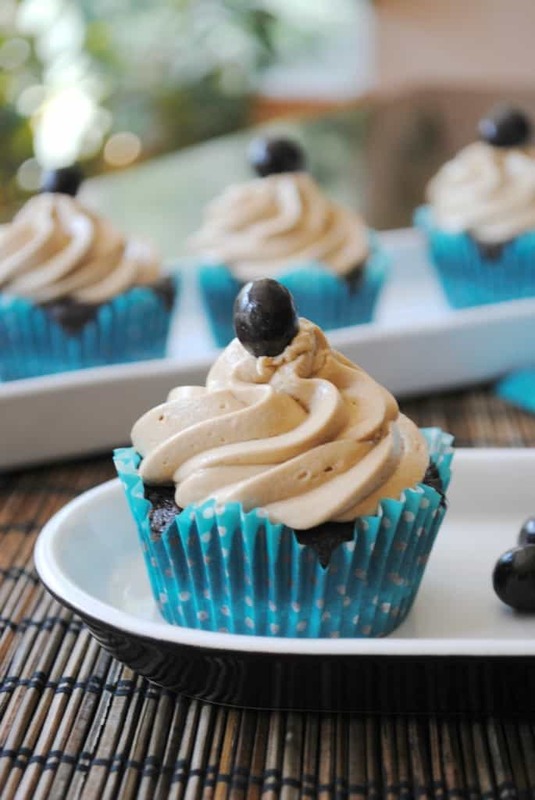 Mocha Cupcakes: rich chocolate cupcakes with a chocolate mocha frosting! 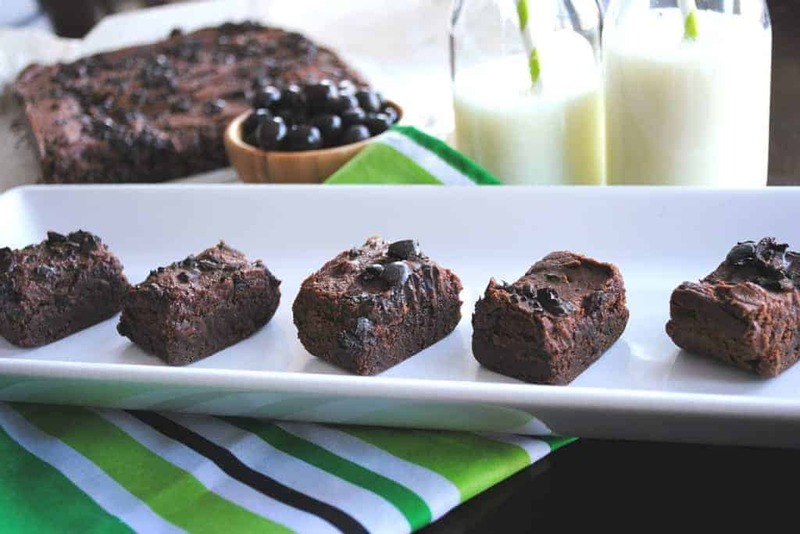 Boozy Brownies: Bailey’s and Espresso meet to create these rich, fudgy brownies! Perfect for St.Patty’s day! Double Chocolate with Caramel Trifle: chocolate cake with a caramel whipped cream filling. To.Die.For. Individual Peppermint Cheesecake Trifles: using Tastycakes as the base, these single serve trifles are perfect in a pinch! Want to get a glimpse into my life? Check out Shugary Sweets on Instagram! 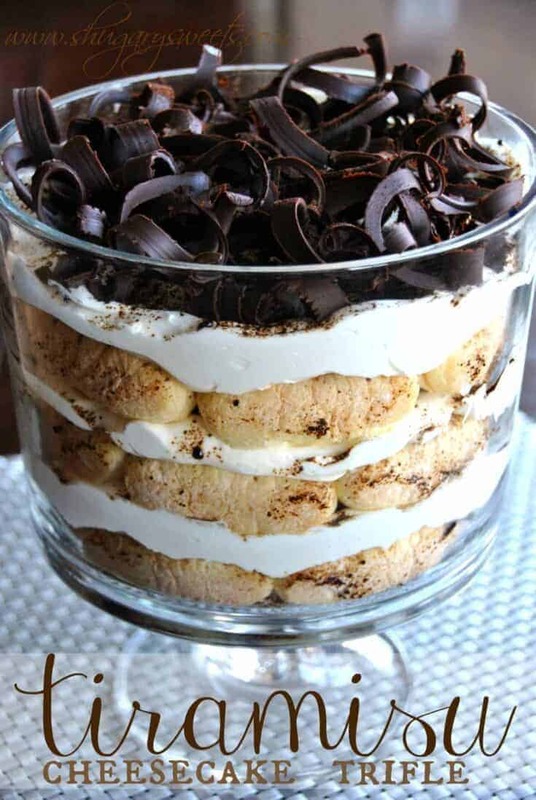 Delightful and flavorful Tiramisu Cheesecake Trifle recipe with homemade chocolate curls! 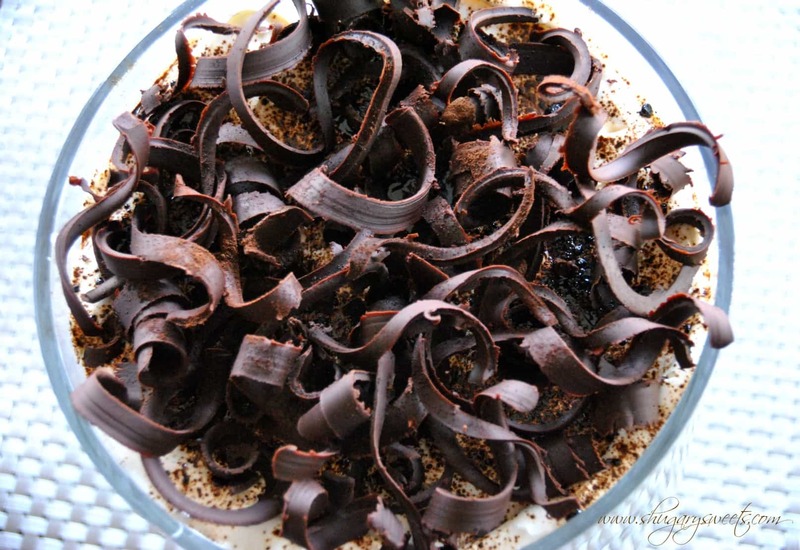 Begin by making chocolate curls. (Follow instructions in this video [HERE|http://www.youtube.com/watch?v=zeemBInz0D8]). In a large mixing bowl, beat cream cheese with condensed milk until smooth. Fold in whipped topping. Set aside. Lay 10 ladyfingers along bottom of large trifle bowl. Sprinkle 1 Tbsp of espresso powder. Top with 1/3 of cream cheese mixture. Repeat two more times. Top final layer with chocolate curls and remaining espresso powder. Refrigerate until ready to serve. ENJOY! Wow, this trifle looks incredible, Aimee! As do those chocolate curls which *almost* look too pretty to eat 😉 can you believe I’ve never had tiramisu? I would love to dive into this bad boy! Oh Hayley, you are an adult now, you NEED tiramisu in your life. But first you have to try to make it past the chocolate curls. I dare ya! Tiramisu is one of my absolute favorite desserts! And those chocolate curls? Oh my word!!! I seriously want to pick off every single one one by one!!! I know the feeling! The curls are amazing, plus they are covered in espresso powder, talk about a nice JOLT! Beautiful chocolate curls! 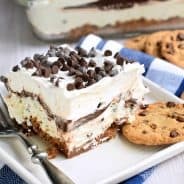 I love the idea of a tiramisu trifle! I must try this! Thank you Eva! Everything is better in a big trifle bowl! This is super stunning Aimee! I love me a trifle, especially with espresso powder! I love espresso powder! And combine it with the dark chocolate? YUM. Yum! Pinning this, it sounds incredible! Thank you Chloe! I hope you get a chance to try it too! I love this “And don’t be afraid that you’ll never use that espresso powder again…just come back here to my blog,” = so true and well spoken! I have the same issue happening with people not wanting to buy bread flour and want to do everything with all purpose. Not quite the same. I love this and those long, ribbony strands of chocolate! I may or may not have eaten several broken curls! But, I was surprised that one chocolate bar created so many curls!! Oh my goodness, girl. This looks sinfully delicious! Thanks Kristen, it is quite delicious, and when you eat too much of it, definitely sinful!! This is stunning! I too think the curls are almost too pretty to eat! 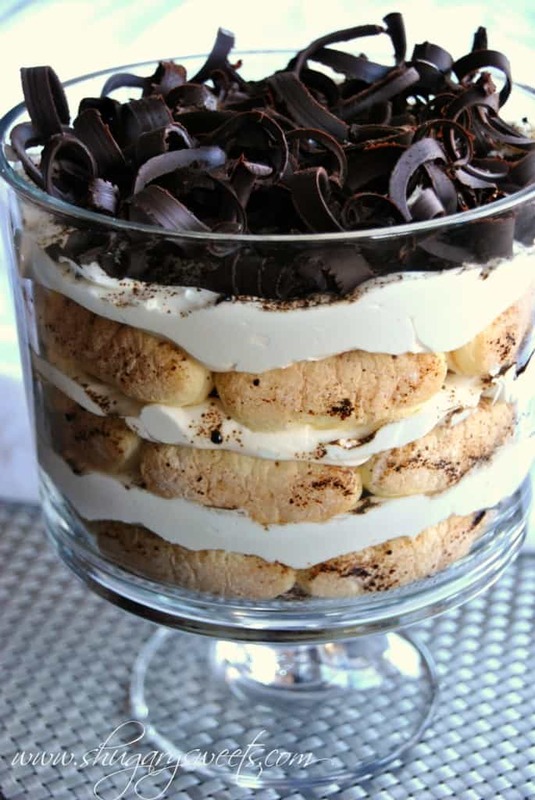 I’d dig in anyway, because Tiramisu is one of my favorites! The chocolate on top is calling me! What a gorgeous trifle!! Thanks Jennifer! It seems to call alot of people! This is gorgeous Aimee! I love the dark chocolate and espresso powder! haha, this cracked me up. Those boozy brownies get ya every time!! This is totally right up my alley… my husbands birthday is coming up and I think I need to make this for him! Oh goodness. 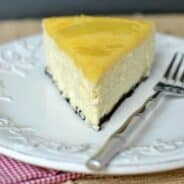 I absolutely love cheesecake. And tiramisu. And I kinda know what I am making soon! It’s a like a beautiful marriage in a bowl! I love this! 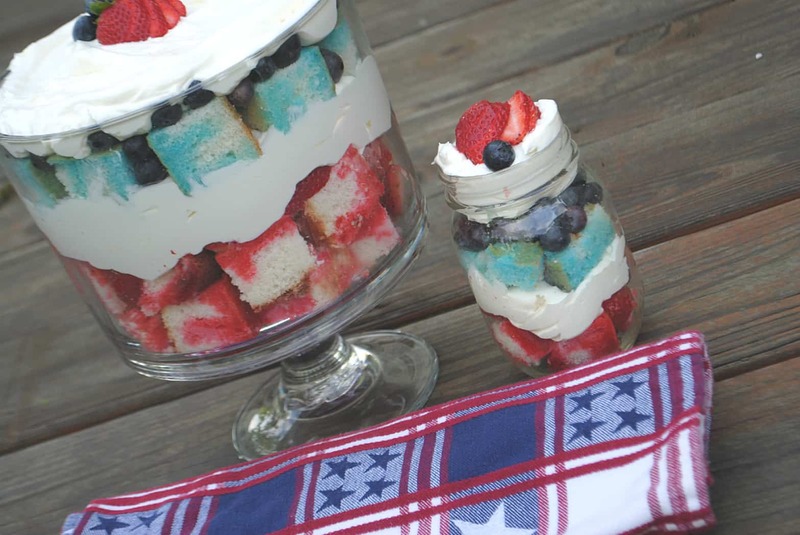 And I totally agree with you on the ease of trifles, yet you don’t sacrifice great taste. And those chocolate curls! OMG! I want to run home and make them RIGHT NOW! OMG! I absolutely love tiramisu!! And whenever I make it I put chocolate in between my layers- your chocolate curls are beautiful! Will definitely have to give this one ago!! Beautiful! I was going to make this tomorrow. Did you have to soften your lady fingers? In the package I bought the fingers are rock hard. Mine were very soft already. You could do the traditional route and dip them in some strong brewed coffee. Just a quick dunk! ENJOY! For the lady fingers, are they the soft lady fingers that are baked and slightly spongy? Or the firm more cracker like ones? Would there be any problem in substituting whipped cream instead of Cool Whip? Not a fan of Cool Whip. Ditto Betty’s question and comment above. Can I use real whipped cream instead? Has anyone tried it? Did you try it, Betty? You can try it, but you may need to stabilize it using gelatin! 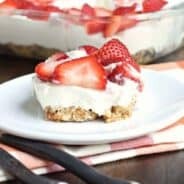 Thank you for sharing your recipes and expertise! Where is the recipe for the tiramisu?